This photo just shows the poor manners of BART passengers by leaving their luggage on the train seats and not letting anyone else be allowed to sit on those seats. I took this picture yesterday (Sunday) on the train heading towards San Francisco International Airport. The trains are a popular option for passengers going and leaving the airport on weekends as most of the seats are usually taken. In other cases, I have found luggage hogging all the seats in the "quad" area, and on this same train where I took this photo, found a huge piece of luggage blocking the doorway. Proper manners with luggage is to park your stuff in the open space where wheelchair passengers use or put them in your lap. Here's a photo of people doing it appropriately. 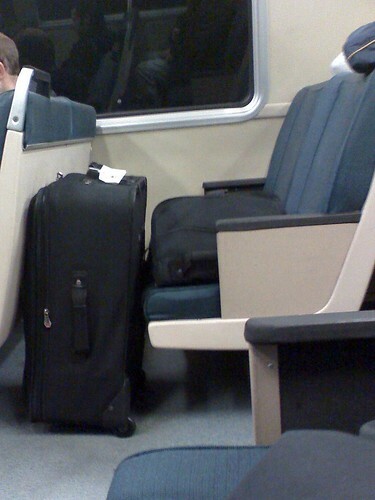 Want to see more photos of bad passengers hogging up space on the train with their luggage? Here's one, another one, oooh another one, and this one is the worst of the worst! I do not see a problem with using more than 1 seat for luggage if there are many empty seats. And BART is to blaim for opening an airport line without adding luggage racks to at least some of their cars. In the train ride I was on, the car was mostly full (nearly all seats taken). I agree with Eugene. The BART trains are not really designed efficiently for riding with luggage.